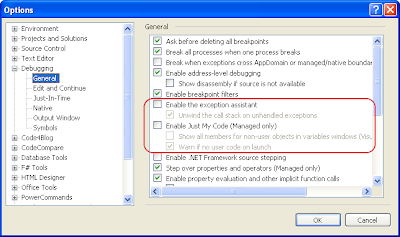 The above specified article helps us on handling WCF SOAP exceptions in Silverlight. In that article it is clearly specified that in order to consume the SOAP faults, we need to adopt either of the following options. Similarly the faults are of two types. In one of my project, I was about to handle faults in Silverlight whose sole purpose is for debugging. To achieve that, among the above, I used HTTP status code modification with undeclared fault type. Upon implementing the endpoint behavior extensions(as specified in the msdn article) , I was eager to view the exception in Silverlight but resulted in the exception "System.ServiceModel.FaultException`1 was unhandled by user code" at my client(Silverlight app). After having searched a lot, I found out a solution in a blog. 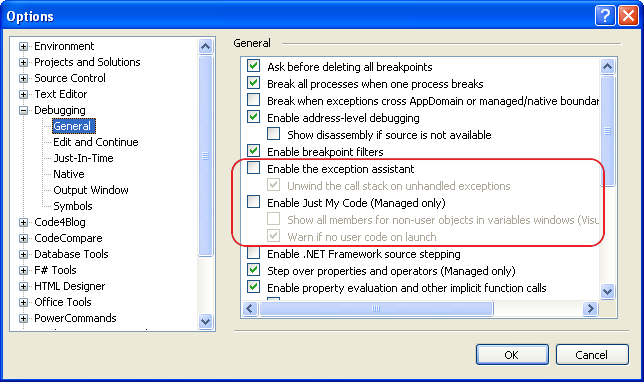 It simply advised to change the following debugging option in the visual studio environment.